A group of heavyset women waddle into a vaudeville theatre, their scrawny partners trailing behind. Once they have taken their seats, a series of oddities is presented. A guitar virtuoso plays his instrument with his toes. A tap dancer is devoured by his own shoes. The stars of the show, a vocal trio called the Triplets of Belleville, sing the swing song that gives the film its title, shuffling and scooting across the stage in exaggerated synchronicity. As their act comes to a close, the camera zooms out to reveal a small girl watching the footage on a grainy television set. Belleville Rendez-vous tells the tale of an elderly woman, once the girl of the prologue. We watch as she helps her gaunt grandson to prepare for the Tour de France, only for him to fall foul of a mafia kidnapping plot during the race. With her loyal mutt for company, she journeys to the gang’s headquarters to free him, and bumps into the Triplets along the way. Now washed-up crones who feast on swamp frogs, the sisters invite the grandmother to join their band, entertaining grotty clubs by plucking and pattering on household goods, from bicycle spokes to refrigerators. The film’s storyline is ably supported by a roster of inventive supporting characters. A remarkably flexible restaurant waiter bends over backwards to please his criminal customers. Henchmen connect and separate like stickle bricks, their shoulders hunched, marching as perfectly rectangular shadows. Zoomorphism abounds. A mechanic who is seen scurrying beneath various contraptions has the features of a mouse. The long-faced cyclists come to resemble horses, parched and wheezing, are guided into trailers in a manner that foreshadows their fate. All but absent of dialogue, the running time is crammed with instances of silent-era slapstick, the dark humour complementing the murky visuals. We view the peculiar, piled-up city of Belleville as if filtered through a grubby lens, shades of browns and greys permeating its steampunk sprawl. It may take a few scenes for viewers to grow accustomed to the fantastical universe and idiosyncratic aesthetic of Belleville Rendez-vous, but those who stick around are in for an offbeat treat. You can watch the trailer here, see the prologue here, and listen to the soundtrack here. Note that Belleville Rendez-vous is the film's UK title. 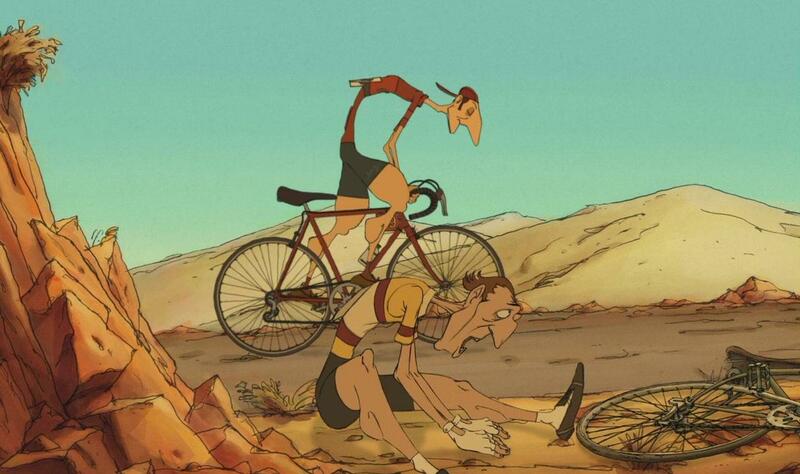 In the US, it was released as The Triplets of Belleville. You can also read an interview with the director by Philippe Moins for the Animation World Network (AWN). Articles about the film available online include this post about its satirical elements by Jay Scott. Which animated films would you recommend, and why? Hanging ribbons and hermit thrushes feature in this trio of artworks related to the word 'Synaesthesia'.